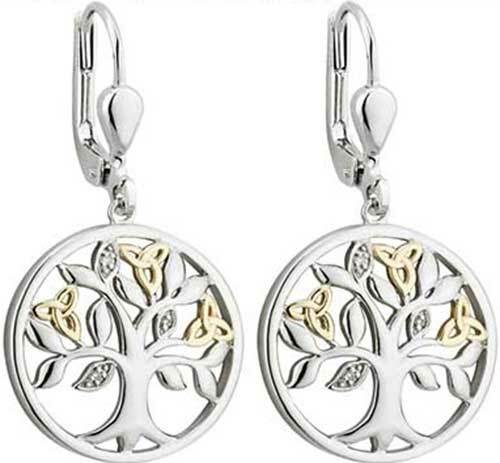 Tree of Life earrings are cast in sterling silver and are enhanced with 10K yellow gold Trinity knot leaves and three of the buds, on each earring, are set with diamonds. The Tree of Life drop earrings measure 1/2" wide x 1 1/8" tall, from the bottom to the top of the latching Eurowires. 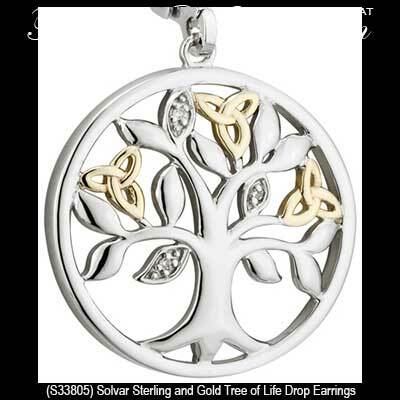 The Fáilte Collections earrings are crafted in Ireland by Solvar Jewelry; they are gift boxed with Celtic knot and Tree of Life history cards, complements of The Irish Gift House.